The main session I went to on Sunday was How To Do Business With the Media ... and Win presented by Dave Baum, longtime media personality and reporter. Baum impressed, entertained, and informed me, which is not an easy feat. I wrote a meaty post on it here, and anyone who's involved with media communication should read it. And if you ever get a chance to see Dave give this training, you need to be there. Don't simply consider it -- GO. His handout alone was worth the price of ALA attendance. Q: Senator, how long have you been stealing campaign funds? Wrong A: I have not been stealing campaign funds! You see, you must always reframe the question so the answer is a positive. If you don't -- even if you answer the exact question, as in the first response above -- you can sound quite guilty. Some reporters (not all!) phrase questions this way to try to trap their interviewees. Sometimes it just comes out that way. In either case, you need to be aware of how responses are edited and which quotes will be the most enticing for the media audience. Being prepared and practiced at this is much easier (and safer) than having to think on your feet. My Sunday ended at the OCLC-sponsored Blog Salon, an open event at the lovely Hilton Chicago where library bloggers, tweeters, and other social media communicators could gather to meet each other in person. 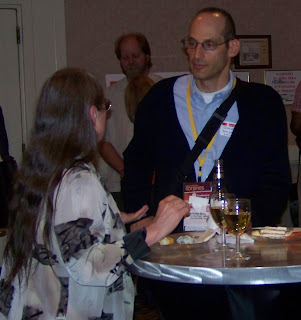 (In this photo, Marydee Ojala, who writes for the Infotoday Blog and ONLINE Insider, talks with Steven Bell from Designing Better Libraries.) I enjoyed catching up with some fellow Jersey bloggers from Library Garden, and also had the chance to match real human faces with blog titles. What a treat! A special feature of this year's Blog Salon was given away by the subtitle: Shenanigans with the Shanachies. Yep, our Dutch friends Erik, Jaap, and Geert were there (they were brought to ALA to speak at the LITA President's Program), and in true Shanachie style, they did some filming at the salon. My husband Michael and I were ambushed for a short interview, which you can see here. If you've been following along with the Shanachie adventures, you'll know that they're about to embark on yet another tour later this month: Ireland! Stay tuned for more news from these globe-trotting library inspirations. Now I think you'll see why this was my biggest ALA day ever: a thrilling morning book launch, a great afternoon of training, and an evening filled with fellow bloggers, highlighted by the Shanachies. What could be better? Oh no! You actually want people to see me stumble on the name your newsletter?! ?